Homeowners are asking for patios with minimalistic designs and efficient, high-end amenities for a space they can enjoy year-round. For today’s homeowner, a patio isn’t just a place to light up the grill anymore. It’s a place to relax, unwind and escape the chaos of the daily grind. Contractors and manufacturers are responding to this trend with clean designs and high-end amenities. “Most patio trends are driven by the homeowner’s desire to make their outdoor spaces an extension of the indoors,” says Fernanda Pedroso, innovation group leader at Belgard, a manufacturer of retaining wall, hardscape and paving stone products. John Butler, owner of Arapahoe Landscape Contractors in Allendale, N.J., says his clients are asking for patios with cleaner, linier designs. The owner of the $2 million company that offers 65 percent hardscaping and 35 percent maintenance services to a 90 percent residential clientele, says the tumbled look is taking a backseat to a smoother bluestone look. Elaborate waterfalls are being replaced with sheer descent versions, Butler says. Clients are requesting rectangular pools instead of ones with curvy, radial shapes. Green walls and hedges are ousting traditional metal railings. Natural, free-flowing stone patterns are being replaced by square patterns made with pavers of different sizes and finishes. Manufacturers are responding to these trends by developing the building materials contractors need to create a sleek, minimalist look. Butler says he’s now seeing pavers that look like tile and hardwood, which he uses in accents and borders. Jesse Cravath, national hardscapes product manager for Ewing Irrigation & Landscape Supply, says that one of the biggest trends in hardscaping is manufacturers moving toward these larger pavers. Gabriela Mariscal, geotechnical engineer for the National Concrete Masonry Association, says manufacturers are also producing pavers with a blend of several colors to help create stone that looks as natural as possible. 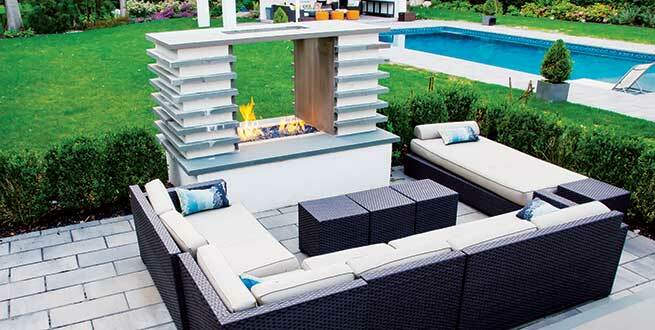 Hardscape experts agree that interior design trends have a big influence on outdoor living spaces. For example, designers are using pavers in different shapes, styles and finishes to create the illusion of different outdoor “rooms,” Cravath says. Outdoor kitchens may not be a new trend, but homeowners are asking for more when it comes to functionality. There’s an increasing trend for outdoor kitchens to be fully functional, replicating everything an indoor kitchen can do, experts say. And suppliers are offering kitchen equipment to kits that include everything contractors need to install an outdoor living space. Designers are also beginning to play with optics, which Pedroso says is now more common inside the home but will soon expand to exterior spaces. Emily Schappacher is a freelance writer based in Charlotte, N.C.